Cosmetics Europe, which represents the interests of cosmetic industry in Europe, published in 2016 the result of its first audit on the compliance of cosmetic advertising. Conclusion: 91% are in compliance. A source of satisfaction for the industry while the allegations are still under the surveillance of the European Union. 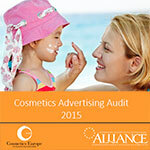 Cosmetics Europe is delighted to share the results of its first independent audit conducted by the European Advertising Standards Alliance (EASA), of industry’s compliance with the Cosmetics Europe 2012 Charter and Guiding Principles on Responsible Advertising and Marketing Communications. The audit also checked the compliance of advertisements against the national self-regulatory advertising codes and laws as well as the European legal requirements – The 2011 International Chamber of Commerce (ICC) Consolidated Code of Advertising, and Marketing Practice; the Commission Regulation (EU) No.655/2013; the Guidelines to Commission Regulation (EU) No.655/2013; and all relevant national advertising codes and relevant legislation. It was conducted across six representative European countries: France, Hungary, Italy, Poland, Sweden and UK. EASA’s audit report finds that 91% of the advertisements of cosmetic products were in compliance with all relevant advertising codes/laws. A total of 1,861 advertisements were reviewed, including 577 television and 1,284 print advertisements aired/published over three month periods – September 2014, March and June 2015.